Claire Windsor was born Ola Kronk in Cawker City, Kansas, April 14, 1897. After a divorce from William Bowes, she and with her three-year old son, Billy, came to Los Angeles in 1920. She was discovered by Lois Weber who had seen Kronk (Windsor) appearing as an extra in a couple of Allan Dwan directed features. Weber changed her named to Claire Windsor and starred her in the 1920 feature "To Please One Woman," a drama about the dissatisfied wife of a banker who tries to come between her and her fiancé. Although the movie did not receive good reviews, Variety said of Windor's performance, "By far, the major part of the acting honors are Miss Windsor's." Her next feature, also under the direction of Weber, was "The Blot" (1926), another drama focusing on an underpaid professor and his daughter (Windsor) who struggle, but happiness comes when the son of a wealthy college trustee falls in love with the daughter. Again , Variety praised Windsor. "The cast is headed by Claire Windsor, who can act in a delicate and appeaeling fashion and is a great beauty besides. . ." Following "The Blot," Windsor made features for Carl Laemmle and Selig before returning to Weber for three more pictures, each with Weber's own brand of social commentary - "Two Wise Wives," "What Do Men Want," and "What's Worth While?" 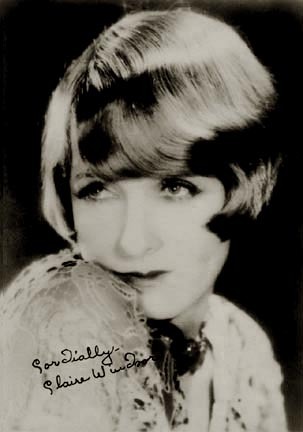 Weber's pictures were not successful enough to keep the director going with her own studio, so Windsor signed a contract with Samuel Goldwyn in 1922, the same year she was named a WAMPAS Baby Star. Her first feature for Goldwyn was the 1922 melodrama "Broken Chains" in which she shared the spotlight with a much more prestigious cast - Malcolm MccGregor, Colleen Moore and Ernest Torrence. Variety praised all three of Windsor's co-players but failed to mention her name at all. In 1924, she met future husband Bert Lytell while filming "A Son of the Sahara" for First National. They married the next year, but the marriage was only to last two years. Windsor filed for divorce claiming in one fan magazine that he was jealous, mistreated her and was too often absent from home. Her divorce complaint charged "mental cruelty.," With the formation of Metro-Goldwyn-Mayer in 1924, Windsor was one of the first stars signed to a contract for the newly-formed company. She worked for MGM for three years (occassionally making a picture for other studios like Universal, Gotham, Tiffany or First National along the way). MGM didn't renew Windsor's contract when it ran out, but she was picked up by "poverty row" studio Columbia for a picture at a salary reported to be double what she was receiving at her former studio. Columbia head Harry Cobn commented upon signing Windsor, "I've got six or seven years of expensive publicity behind my star when I chose Claire Windsor. Metro-Goldwyn-Mayer spent a lot on making her famous. She has a huge fan following her all ready to rush to see her pictures on the screen." She was to make seven more silents after signing with Columbia (not all were with Columbia) before making her first talkie in 1929 for the low-budget studio Tiffany called "Midstream" and co-starring Ricardo Cortez. She stopped making movies for awhile after this and chose instead to do a road tour with Al Jolson in Wonder Bar (1931-33). She was only to make seven more pictures between 1932 and 1946, mostly in secondary roles or bit parts. She did stage work during this time, however, and continued to be very active in the Hollywood social scene. In the 1960's, she became very interested in art and served as the president of The American Institute of Fine Arts, an organization that was co-founded by her friend Mary Pickord. She died Oct. 24, 1972, from a massive heart attack at age 75.